The licensed StoneTree® Manufacturer visits the fence installation site to determine property lines, fence placement, gate or opening locations, and any other details pertinent to the project, such as location of lighting and security features, then compiles all the measurements and other information for the casting facility, where the wall sections are then manufactured. While the panels are being precast, a construction crew mobilizes on the jobsite to install the concrete fence. They locate where the footings are to be set, then an auger is used to drill the holes every 15′ on center for the footings. The footing forms are accurately laid out and set to grade with the structural supports clamped in the forms and then they are filled with concrete. After the footings have cured, the panels are brought from the casting facility and set into place. Caps and other finishing touches are installed, and a stained sealant is sprayed onto the wall, completing the StoneTree® Concrete Fence installation. 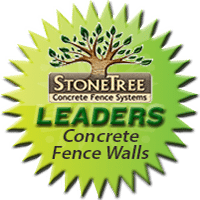 StoneTree® Fence Wall Sections are easy to remove or replace if necessary. A damaged section may be lifted out and replaced without any impact on the adjacent boundary wall sections. Sections may also easily be removed to allow for the installation of temporary or permanent access.